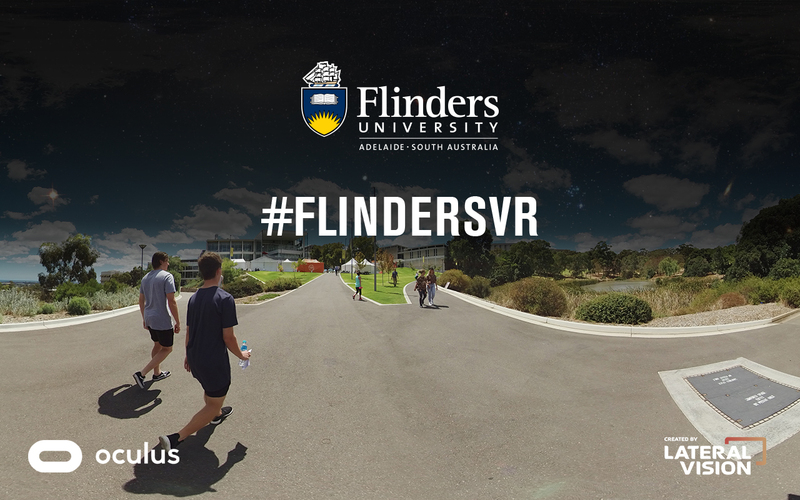 The Flinders University virtual reality experience is an interactive and immersive tool to show prospective students the Bedford campus and a range of different college areas. Flinders wanted to better engage with prospective students and turned to Lateral Vision to create a gamified ‘choose our own adventure’ style VR experience. To start the experience, students are taken on a virtual campus tour with Emily, a student ambassador, to explore the Plaza, Student Hub and even get an aerial view of the campus. Students then get to choose their own adventure and select which study area to explore further. This VR experience uses 360 stereoscopic videos to give users the feeling of realistic depth to the videos, adding another level of immersion. We then used computer-generated imagery to create a Minority Report inspired menu and navigation icons. The whole experience has been designed with the end-user in mind at each stage of the project. Due to a diverse audience of end-users, the content had to be suitable for all people and measures taken to minimise motion sickness caused by VR. The VR experience has been rolled out at schools and at exhibitions with a custom VR setup using the Oculus Rift headsets and hand controllers. These have been built into custom cases to ensure easy transport and set up on location. To reach a wider audience, the 360-degree videos are also available on YouTube (see here) and can be viewed in VR mode with Flinders University Google Cardboard headsets. The virtual reality experience has been a fantastic resource to showcase the programs and facilities available at Flinders University. Prospective students of the university now have an interactive tool that enables them to explore the university campus and study areas first hand. Users have found it to be fun, engaging and unique. It’s an excellent, innovative resource for our office to use when engaging with schools and the wider community, and it has already featured as the centrepiece of a number of major recruitment events.